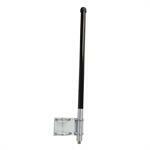 Mobile Mark’s OD-MOD2 antennas are ideal for Mining, Agriculture, Construction and Military applications. These Omani-directional antennas have become the go-to antennas for extremely high vibration applications found in Mining, Agriculture, Construction and the Military. Originally designed as point-to-multipoint hub antennas for private networks, these antennas are used on large vehicles where typical mobile antennas are not durable enough. Filled with a microwave grade structural foam to protect the antenna elements, these antennas continue to perform in tough environments. OD-MOD2 Series Antennas keep your vehicles connected to the wireless network for reliable, consistent communications and monitoring.